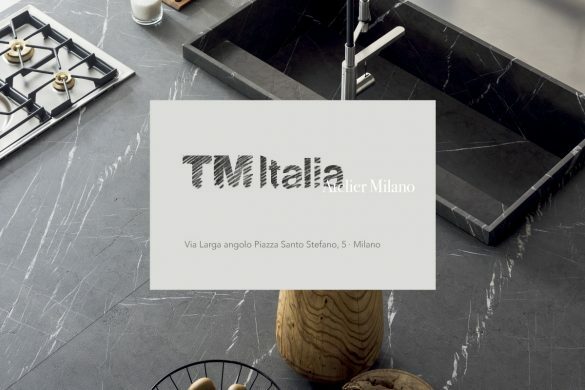 TM Italia encourages the vision of the most brilliant designers and satisfies the tastes of the most demanding and sophisticated clients, introducing a selection of lacquered kitchens and special and refined materials supported in the new campaign “Pret à Inspiration“. The special lacquers come under the most exclusive and high quality finishings that could be adopted in the customizing process of a kitchen space; if used in the design of the interiors, they lend a polished elegance and charm to the whole composition. 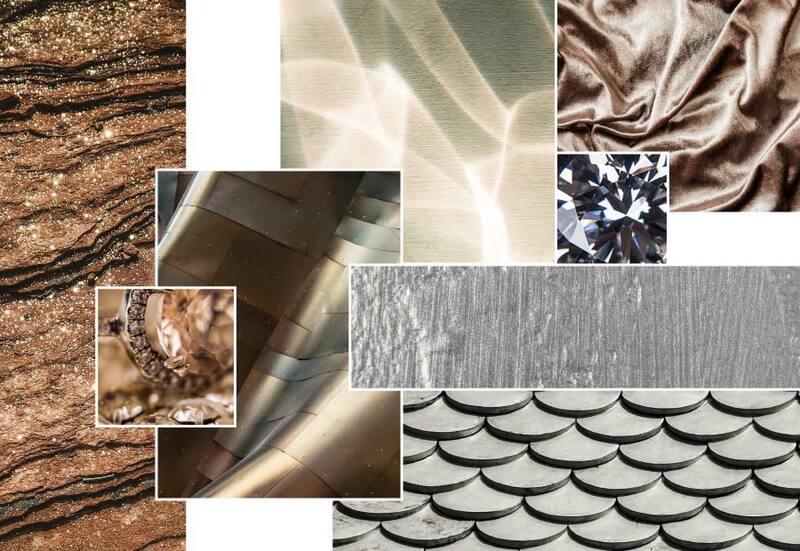 We are talking about shimmering metals, either innovative or with a time-honored tradition that brightens the look of the most daring kitchens that wish to stand out through charm, originality and the attention to the details. Among the 400 finishings chosen by the company for the design of the kitchen space, the special lacquers cannot be missing: a selection of 8 metal high-quality finishings suggested on the designer’s vademecum, which you can download by signing up to the reserved area. 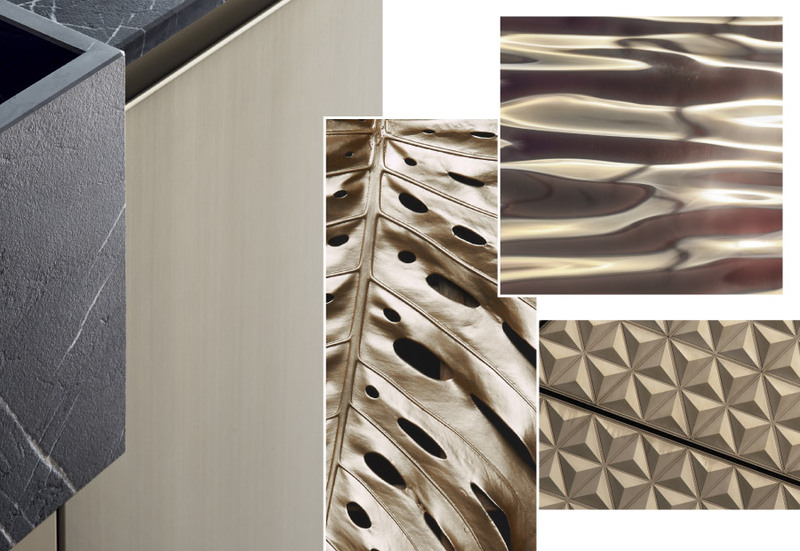 As a matter of fact, besides the lacquers shown on the list – both polish and opaque – through which it is possible to create any kind of lacquered kitchen projects, TM Italia makes its savoir faire and its craftsmanship available regarding the processing of traditional materials like Copper, Brass, Bronze to realize unique works to be included in one’s own home décor, like real works of art. Those who love to stand out and who would like a bright and polish effect in the kitchen as well, will never settle for a simple and ordinary lacquered kitchen. For them, the company created a range of special metal finishings to be employed in a lacquered kitchen project that is thought to be original, durable and with a timeless charm. Materials like copper or brass – for instance – have an intrinsic brightness and iridescence. Warm, bright and reflecting, they are traditional materials that are coming back both for the upholsteries of the kitchen’s components and the graft of favored details with high-style finishing. Some metals like copper are a big piece of history and, still nowadays, it is one of the most resistant. Appreciated and used by architects and designers, it represents a long-term investment for homes as well, due to its durability. Using the metallic lacquering in the kitchen gives substance and three-dimensionality to the element itself, where is it employed, enhancing the shapes and volumetric. Thanks to the geometrical characteristics of the material being processed, the color changes according to the surface, giving a three-dimensional effect. The surface, covered in a metallic finishing seems like acquiring new looks, always changing depending on the lights and shadows. Develop your new kitchen project with TM Italia and do not miss the advantages of the entire range of Special Lacquers on your next kitchen. Discover the special lacquered kitchen. Already used during the roman times, the red metallic lacquered– copper – is becoming a leading presence in lofts but also apartments, offices and shops. 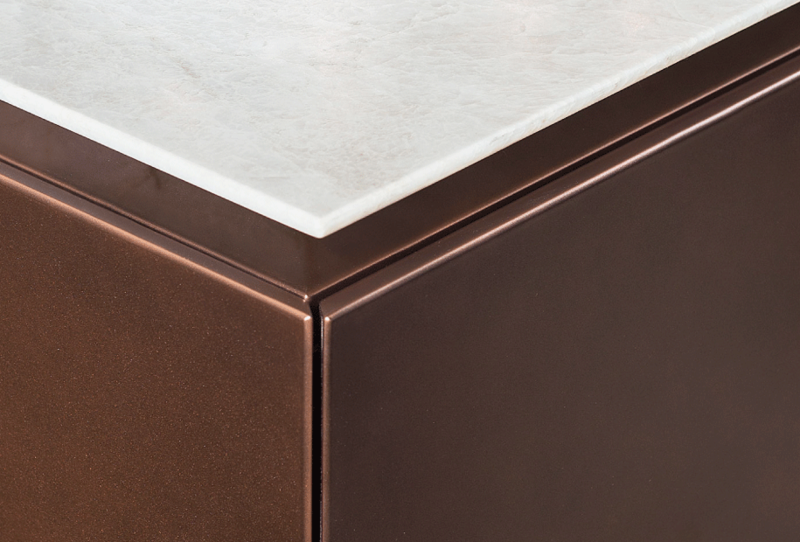 TM Italia has also been using it to customize its kitchen projects like this creation, which combines the elegance of copper with characteristics of materials like stone or wood. In a refined living space, where every detail is played to perfection, we added a central island with copper T30 concept shutters and cabinets with copper facades. A unique combination of elegance, functionality and quality, with not only fine but also warm and welcoming materials, sober and sought-after shapes, performed with great care. The steel lacquered kitchens, like D90, have a lot of attitude: shutters and facades show a lacquering with an oxidized steel effect, more modern when matched to authentic materials like the Canaletto walnut. 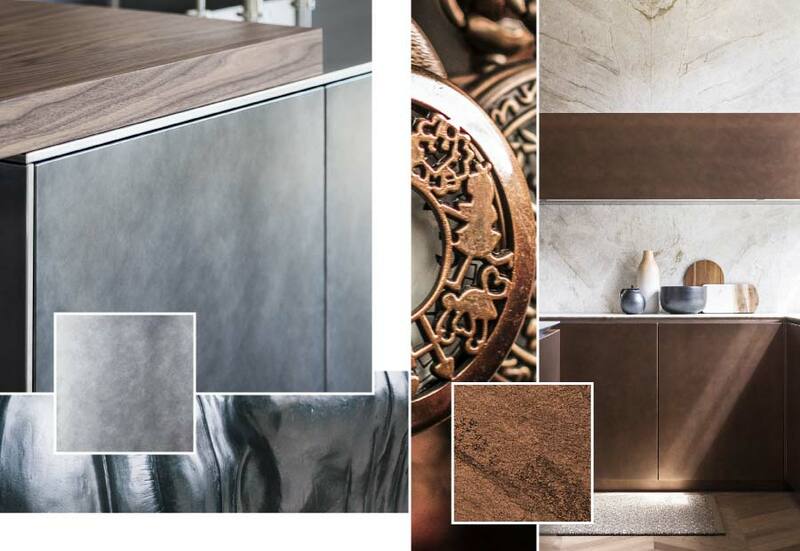 Oxidized copper – or with brown effect – bronze, polished or oxidized steel are just few of the several metals used for the charm TM Italia kitchens, allowing the highest compositional variety and freedom in the finishing applications. The company’s list of the special lacquered colors range is wide: Oxidized Steel, Titanium, Graphite, Champagne, Brass, Dark Bronze, Oxidized Copper, Corten. Eight shimmering metallic lacquers, with a chromatic depth that gives brightness and a unique touch to the whole space. As in the case of this composition, where natural colors are carefully selected and matched to finishings and original high-quality details. Here the island, developed according to the T45 model, has lacquered bases with a Champagne finishing metallic effect, the same used for all the wainscotings and for the open cabinets. Are You designing a quality kitchen? Have You decided that the special lacquers are the perfect finishing to turn your kitchen project into a very unique and elegant one? 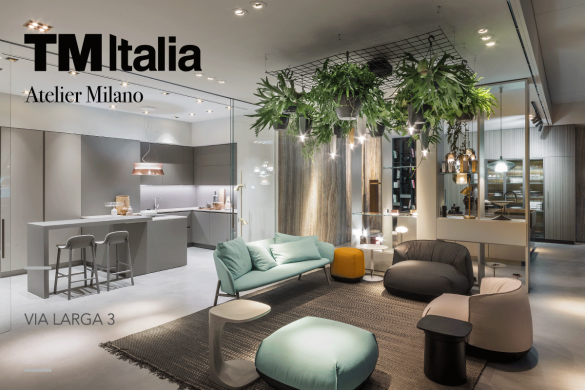 TM Italia has conceived a stylistic solution which is able to give more character to the whole space.